Click on the title above so that the Facebook share button will appear at the bottom of this entry. If you find any of this interesting, it would help my cause for you to share it with your friends by clicking on the appropriate button following the post. By doing that, you’ll help me to gain a reading audience for this blog. Thanks for taking a look! Note from William Torgerson: I first met Adam Elenbaas when he became my fellow graduate student in the M.F.A. in Creative Writing Program at Georgia College and State University in Milledgeville. Because Adam and I wrote primarily in different genres (Adam in creative nonfiction/ myself in fiction) we didn’t see much of each other in classes, but we did fall into a fairly-regular Friday afternoon round of golf, where I think cheap green fees, wide-open spaces, and lively conversation were the primary attractions. Adam grew up in rural Minnesota the son of Methodist Minister, and he has a B.A. in Philosophy, an M.A. in English Language and Literature, and an M.F.A in Creative Writing. Currently, Adam lives in New York City and is working as a free lance writer and yoga and meditation instructor. Adam is also a contributing editor and one of the founding writers of RealitySandwich.com, a popular counter-cultural web magazine devoted to consciousness studies. In the subsequent interview, my questions for Adam appear in italics and his responses follow. For those who haven’t heard, can you give us some background on the Ayahuasca plant and how it is used in a healing ceremony? Ayahuasca is a powerful medicinal tea that has been made by shamans of the Amazon for hundreds, perhaps thousands, of years. The tea is made from a leaf and a vine. It is cooked over a fire with water and boiled down for many hours. Then it is drunk by the shaman and all the participants of the ceremony. Throughout the night, the shaman(s) guide the ceremony by the singing of traditional songs called “icaros.” Along with the icaros, the shamans shake chakapas (leaf rattles) and use mapacho (tobacco) smoke to anoint people and protect the space of the ritual. The effects of ayahuasca are what we in the West might call “psychedelic.” Yet, the experience is also vastly different from “getting high” or “tripping out.” The senses are all enhanced, sharpened, or heightened. The sub-conscious is brought to the surface and is often projected into visionary symbols in front of your eyes. The tea is also a purgative, so one of the features of an Ayahausca ceremony is the cleaning of the deepest levels of psychological disease. As the repressed layers of the self are faced, purging occurs. Aside from this very “psychoanalytic” explanation of the healing process, Ayahuasca could be said to quite literally open up a door to the spirit world. I’ve often said that it’s like realizing Narnia is for real, and you’ve found a wardrobe door. Ceremonies usually last about six hours. That being said, I’ve also been in many ceremonies that lasted until dawn! Talk about hard work. Which is why I say that this is quite different from taking acid or mushrooms or smoking pot. Ceremonies are often described as “many years of psychotherapy” in one evening. It’s an incredibly disciplined and challenging ritual to take place in—as ancient and revered by people in South America as any vision-quest tradition on the planet. At some point you hadn’t conceived of this book, and now it’s been published with Penguin. Looking back, what were some of the most interesting parts of the process for you? The process of writing my book was the process of not just textual revision but also self-revision. As I was working with an incredibly powerful psycho-therapeutic tool (referring now to the ritual use of Ayahuasca) I was “coming of age.” The ceremonies in South America inspired me to write about my life, as if writing about it were the Rosetta Stone for truly understanding myself, my karmic heritage, my relationship to the church, my preacher father, Christianity and Jesus, and the new age or “hippy” culture I was supposedly now a part of. Taking a psychedelic plant with shamans certainly tends to get you labeled a hippy, anyway! I’m interested in the ways that you connect God, especially Jesus, to the use of hallucinogens. Can you say a little about how that works for you? I don’t think it’s as simple as taking a hallucinogen and having visions of God. As we saw in the 1960’s, people often take drugs for hedonistic purposes, and even though they say they want to “get higher” or “expand their mind,” they end up having nightmarish experiences, even schizophrenic breaks from reality that can be seriously damaging to long term mental health. I worked with schizophrenics for the past two years in NYC as a social worker, and many of my clients experienced their break as a result of too many unconscious drug choices. That qualifier being issued, I think it is also possible to use psychedelic plants with integrity and respect. After all, that is how shamans and indigenous peoples have used psychedelic plants for thousands of years. But okay, once you are in one of these rituals, how does the ritual and the plant facilitate these transformational visions of God? My answer is that it does so by eliminating the consistency of mental concepts and boundaries. Wherever a system exists by principles founded on opposites (it is this way, not this way), Ayahuasca will eliminate the dualism and present a visionary episode in which x and y are not an either/or but a both/and. It does so in a way that is so true, so purely true, that you must face the truth that you ARE everything you despise. You ARE everything you reject. The Universe holds all of the possibilities you would like to marginalize or exclude. As your former belief system (based on various forms of judgment and marginalization) is deconstructed, so are you. During those moments, you will cry or laugh or vomit or scream or shake. The shaman will come to you and sing or start blowing smoke over you until you come to a place where you have to accept the paradox of living in a universe that is ABSOLUTELY—RELATIVE. What does it mean to be absolutely relative? It doesn’t mean a contradiction. Not ever again. Instead it means living in the moment (the absolute) and listening for the voice of discernment (the relative) that is always there to guide you. People come away feeling alive for the first time because they are not living by principles but by faith (listening to God’s real-time voice, not laws, in the moment). Just imagine getting bombarded by the infinite nature of the cosmos, and the infinite nature of something you are seeing for the first time, called your soul, for six hours straight, in the most intensely catalyzing experience you’ve ever had. And the entire time, it’s not that you are seeing God, it’s that you are seeing something you never had the ability to even imagine. It puts you so much in awe that you say, “Oh my God,” over and over again, and as you are doing so you realize that at one point that very saying, “Oh my God,” was a real statement uttered during the most intensely real moments of human experience. And now it is you, having the primitive realization that you are calling on God, and not by habit or cliché, but by the realization that something vastly larger and more creative and conscious than you is present and always has been. Did I read you right in that I believe write that you experienced forms of a Godly connection with your use of recreational drugs before you participated in the Ayahuasca ceremonies? I think that many meditation instructors, yoga gurus, even pastors like my father, were at first inspired by more recreational psychedelic experiences. In some ways the psychedelic experience simply blows your mind to the point where, once again, you say, “Oh My God,” and you mean it. It’s not just a saying. That being said, I am very cautious to glorify the “psychedelic” experience, as if it is just one thing that can be gained by mechanistically swallowing something, etc. Not all psychedelic experiences are gateways to the divine. They are ancient religious healing technologies that should be used with a great deal of care. Some of my first psychedelic experiences were also very scary, and I had no help or context to place them safely into my psyche. I suffered as a result. 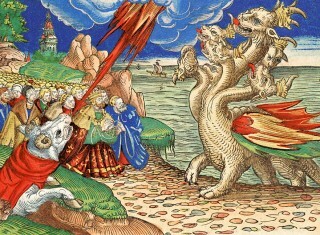 Certainly I can imagine many Christians dismissing your book as written by someone who passes off getting high as religious experience, but you’ve got me thinking about your own visions—where you write thick descriptions of a dragon—and how there’s a lot said about a dragon in the book of Revelation. Do you see connections between your visions and the Biblical dragon? How do you see the visions you’ve experienced as connected to the visions in the Bible? Well, not just the dragon from the book of Revelation, but the serpent from the book of Genesis. The serpent is largely misunderstood in the book of Genesis, I think. I refer readers to Joseph Campbell’s ideas about the creation myths and serpent symbolism within them. The snake is an age-old religious metaphor. Snakes shed their skin and are continually “born again.” They drag their bodies along the rocks and die every so often. So do humans. In the book of Genesis, the fact that the serpent is the guardian creature at the foot of the tree of the knowledge of good and evil is representative of the classic “genesis” of the soul’s birth into duality (where before it had been situated in Eden, which was an eternal place). Now, once the fruit was eaten, humans will know the cycle of birth and death, over and over again, because that’s how the life cycle works in time and space. The message of Christian salvation (Jesus stepping on the head of the serpent, for example) is the idea that people can stop the cycle by remembering their eternal self within the life-death cycles of dualism (voila! Salvation). The idea of the serpent as a tempter is not present in many other world myths that also have a serpent at the foot of a tree of the knowledge of opposites. In those myths, the serpent is simply a guardian. So you see the serpent is often revered as tempter, deceiver, predator, and also as a healer, regenerator, evolver, etc. The entwining of two serpents, the double helix, is another common motif that represents this dual nature of the serpent(our own DNA is double helixed), so there is always that paradox about serpents that represents good and evil. One represents our fall from grace, and the other represents the evolution of consciousness. Does the “purging” in an Ayahuasca ceremony have anything to do with the Christian notion of sin? Purging is just an existential workout. People work out for lots of reasons at the gym, and the same thing goes for Ayahuasca ceremonies. Most of the time when people purge, they are actually purging the notion of sin itself and not anything particularly “sinful.” In other words, if you feel that you screwed up in the past and you won’t forgive yourself or make changes and move forward, then you are condemning yourself. Condemning yourself is impossible because the nature of reality is love and acceptance. Condemnation is impossible. Life accepts everything. So does God. And since you exist eternally already, there is no salvation prayer necessary. If people don’t “know” these things, or aren’t operating with some semblance of these truths in their lives, then they are trying, to some extent, to live under the banner of a lie, a deception, a condemnation, or a judgment. All of these are impossible. Trying to do what is impossible creates stress in the body and mind. It creates suffering. Ayahausca simply shows you the truth: “You have been struggling against your SELF. Life accepts you and everything always.” Once you see the truth, if you try to put up a fight (which is pretty inevitable given our conditioning) you purge. Ayahuasca helped me to stop fighting (as does any good spiritual practice from any religion). It’s not about purging yourself of sins; it’s about releasing blockages that you have to love (the impossibility of sin). It’s about seeing where you are holding and then releasing. It’s about finding where your fight is and then making peace. It’s like in the movie Star Wars. Luke had to go into the cave to face himself, but he was told not to bring a weapon. If we make “sin” the enemy, then we bring a weapon into the cave. We don’t need a weapon to understand ourselves, just courage and love and peace in our heart and mind. Purging might seem violent, and it is often scary, and some people enter ceremonies or caves with weapons. I don’t think it’s necessary, and I hope my book reflected that spirit. When it comes to your participation in Ayahuasca ceremonies, there’s a point in your book where you write, “I don’t need this anymore.” Why did you believe that? What changed and brought you back to the Ayahuasca tea ceremonies? There are many moments where you say, “I don’t want to go back into the cave ever again.” But, if you know in your heart it’s out of fear, then you know there is still more to learn from your cave. In truth, I was afraid. Other times when I have taken a break from drinking Ayahuasca, it has been because I felt like life was calling me to other things. It’s always about listening and being real with yourself. I think we should all have some practices that call us into the cave to face ourselves again. God is like a mirror. The result is always that you get to live with a renewed sense of hope because the answer in the mirror is always forgiveness. Sometimes we think, “I ‘get’ the message” of forgiveness, and I don’t need to learn it again. But it is not a once-and-for-all principled lesson; it’s not a once-and-for-all prayer that you pray. That would warp it again into a fear-based ideology or dogma. Forgiveness is a way of life that sometimes needs an oil change or a detox or some retreat or some work. It’s very easy to forget love, and I find the experience of facing myself and being humbled something very refreshing. Dare I say that I might get pummeled the next time I go into my cave! Are you at all concerned about the long term effects of ingesting the ayahuasca tea? Has anyone looked into that? No. I’m not. I think the fact that this practice has existed for hundreds, if not thousands, of years is the best testimony to its sanctity. I would be curious to see studies done, though! As a writing professor working in classrooms, I’m always talking about the professional conversation that surrounds any topic. This means I ask students to think about their beliefs in relation to the major voices speaking into any given field. What’s some of the history of the conversation surrounding Ayahuasca? Who is writing about it today? Where are the hottest pockets of tension? I’m the first to publish a personal memoir from a major press about the subject. There are anthropological works. The best probably being, Singing to the Plants, by Stephan Beyer. He blurbed the back of my book! Otherwise, Jeremy Narby, (a Stanford Anthropologist). Lots of conversation about eco-tourism and the diluting of indigenous traditions by white people. That’s less of an issue for me because I’ve met too many indigenous shamans who believe, and have known for decades, that the destiny of this plant was to be shared with the world. Now that the book is out, are you working on a new project? Can you give your readers some idea of what they might see next from you? I’m working on another book. Its subject matter is a sort of second tier of the “coming of age” journey. It’s about settling into your thirties, finding a wife, starting a family, falling in love, finding yourself and your professional contributions dialoging with larger societal issues, your implication in the snares of your own culture and family history (money, power, materialism, indifference, marital faithfulness, etc). The subtitle of the book is, “How to Fall in Love and Not Die.” It will also explore my deeper experiences with Ayahuasca ceremonies and several new Christian-based Ayahuasca traditions I’ve explored. Note from William Torgerson: to share on Facebook, click the title on this blog and then click the “Facebook Share” that follows this post. In order to promote my own book, I’m always looking for Facebook friends who read. If you’re willing, send me a friend request. Both Adam and I welcome comments, questions, or challenges meant to extend the conversation that lives in this interview. Adam’s blog on Reality Sandwich. The Publisher’s website for William Torgerson’s novel, Love on the Big Screen. It’s a novel about a college freshman whose understanding of love has been shaped by late-eighties romantic comedies such as Say Anything and Sixteen Candles. This entry was posted in Torg Life and tagged Adam Elenbaas, Ayahuasca, Ayahuasca Tea, Christian, faith, Fishers of Men, Georgia College and State University, god, hallucinogen, Jesus, Love on the Big Screen, M.F.A., psychedelic, recovery, William Torgerson, writing. Bookmark the permalink.